The rathar is an immense beast greatly comparable to a fox. Males are bigger than females, who are built more for speed. Males come in brighter colors than females and both have short spikes of protruding bone along their spine. Rathar are impervious to magic and are quite intelligent. They go into a dormancy for up to a third of their life, to delay their death. Species info credited to Darkeh. Appearance Rathar are very basically compared to immense foxes, although there are plenty of differences. The first and foremost being size; male Rathars usually reach a height of twelve to fourteen feet, length varying from ten to fifteen feet, including the long plumy tail. Females are smaller but built for faster speed and better agility, reaching heights of ten to thirteen feet and lengths from eight to twelve. Secondly, color. As most animals in the wild, the male is flashier, with bright, eye-catching colors such as a full, rich red or a thick, lustrous gold. Females are more subdued in greens and blues or sometimes brown, rarely, very rarely, black. There are no black males. Thirdly, structure. All Rathar, male or female, have short spikes of protruding bone along strategetic places on their body -- elbow, knee, spine, neck. These spikes lay flat under the fur (which is impervious to all kinds of magic and highly valued for this property), until use, where they lock in place as a deadly natural weapon. However, as they impede movement, it isn't often you'll be fortunate enough to see this unless you attack. Rathar pups have soft spikes that harden with age, and lighter pelts; they darken as they get older until reaching the 'adult hue'. 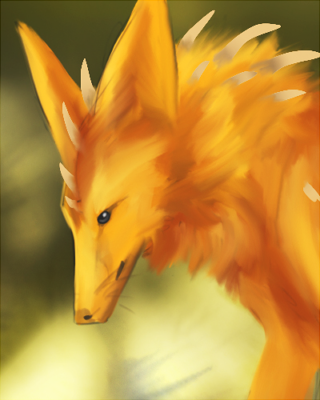 Culture As listed above, Rathar have the bone-spikes and magic-proof fur to their advantage. They're a very physical race, able to keep pace with a dragon in flight, sometimes for up to a full twenty-four hours. Favourite means of attack; head-on, and they can be vicious. Once a Rathar's jaws are clamped around a shoulder or an arm, be prepared to lose a healthy chunk. Abilities Rathar are impervious to magic. They're also quite intelligent, and live for upwards of two hundred years. However, very few can live past three hundred. When a spell strikes a Rathar's coat, it's absorbed; the Rathar is then able to use the energy to fuel itself if tired or hurt. It won't erase the wound, but it will numb the pain and fill the body with adrenaline. It's quite feasible for Rathar to never eat, living off of the energy taken from spells meant to kill. However, they are as easily susceptible to blade or poison as any other, and there is no coming back. One last ability; Rathar are able to go 'dormant', hibernating for up to a third of their lifetime and delaying death. They are vulnerable to outside influences, but will go into a state of half-life. It prolongs life for up to fifty years, but costs nearly twice as much in 'dormancy'. This ability was used after the early wild dragons when a mild calamity shook Felnova's face and drove the Rathar into slumber. After many decades, they are finally awaking from their slumber. Before there were any sort of canine, like wolves or rathar, the purpose Death sought had no proper creature. He needed a sharp-witted creature with long fangs and skill in magic; thick fur, and long legs. The dark god drew up from a well of darkness a malleable shape, twisting captured lightning into a sharp and muscular form, giving strength to bones with shards of broken ice. Long fur, to protect against both cold and attack, was woven from the shadows itself, covering the beast head to toe. A long muzzle was filled with sharp pieces of ice and shaped into fangs and teeth, and a desire for flesh was set deep within its heart. This creature, called the eucyon, led a massive pack of its own kind for hundreds of years before disappearing from history. Though the eucyon are no more as a race, the Ancient First still slumbers somewhere in the Realms. Strong though his creations were, Death wasn’t fully satisfied with the eucyon. Powerful though they were, he wanted something capable of challenging even the mighty dragons. To that end, he took a few dozen eucyons, and selected the strongest from among them to be remade into the new form he envisioned. He refocused the creature’s magic, taking from it its offensive spellcasting and infusing it into the creature’s pelt, rendering it immune to spellcraft. Its pelt would absorb all magic energies, in turn feeding the creature enough that it could live off of magical energy entirely if an abundant enough source could be found. He gave the beast great speed and stamina, enough for it to keep pace with a flying dragon, for hours on end if need be, and made its body more akin to that of a fox. It was swift and agile despite its great size, which could rival that of a typical dragon. Then he coaxed short bone spikes through its hide, and hid them beneath its fur to be revealed only as needed. He instilled within its soul an instinctive preference to feed upon dragon flesh, and set it free, releasing the first rathar into the world. As it ran, Death smirked, and made one last alteration to its appearance. In mockery of The One, the rathar took on a brilliant golden sheen, with pure white fur on its belly, its paws, around its eyes, and on the tip of its long tail. As it disappeared into the wilds, he crafted the other eucyons he’d gathered into rathars. Immune to magic as they were, they took many dragons by surprise, and slew them, before the dragon learned more effective ways to fight the beasts. Though they are a rare sight these days, they remain as fearsome as they ever were. Their pelts were and still are highly prized for their magical properties, but actually managing to kill a rathar to take its pelt is a difficult task. Name: Kithazukalina. Location: sleeps in a sealed-away cave in Ristell's underground. Status: Alive.